Two schoolgirls from Lancashire were arrested after six pupils took what was thought to be the drug ecstasy during a school break, police say. The teenagers were arrested at a school in Blackburn on Tuesday after police were contacted by ambulance crews. The schoolgirls, both aged 14, were released without charge, one pending further investigation. The six pupils, aged between 14 and 15, were taken to hospital but were sent home on Wednesday. Police are carrying out inquiries at the school, and are examining a quantity of tablets that were seized. A Lancashire Police spokesperson said: "When we got to the school six students were showing signs they had consumed the drug and were taken to hospital. "We found less than 10 pills." Seven pupils have been excluded from the Witton Park High School. One girl is facing possible permanent exclusion from the 1,065-pupil school. Head teacher John Gosling said: "Incidents of this nature are pretty rare. "We are now working with the police investigating the matter." 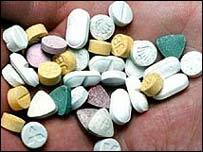 Is ecstasy a dangerous drug or not?